Many of us can walk through our homes and find items to sell on Amazon, Ebay, or Craigslist, and we’ve read some excellent posts about how to make extra money from such items. However, if you are creative or have an eye for vintage items, consider selling on Etsy. Although I didn’t truly start selling until 2010, I have been a member of the Etsy community since 2006. Etsy requires all items to fall into one of three categories: handmade, vintage, or supplies. Vintage = must be at least 20 years old. I’ve had good luck selling vintage clothing, fabric, sewing supplies, and books. Supplies = anything you would use to make something. This includes fabric, paper crafting tools, patterns, beads, etc. I have successfully sold items in all three of these categories, but primarily focus on the handmade items. Let’s say you have a creative bone (or two!) in your body. Think about items you’ve made in the past. What have friends requested from you for birthdays, weddings, new babies, or holidays? Are family members asking you to make them a gift instead of purchasing one? Consider making several of these items and listing them on Etsy. Perhaps you have an eye for vintage items. Maybe you love going to estate sales and finding vintage clothing. By replacing a button or repairing a frayed hem, you could list items on Etsy in the vintage section and see a large return on investment. When my husband’s great-grandmother passed away, we inherited a house full of vintage goodies. While I kept some sentimental items for our family, many of the items were sold in the vintage section of my Etsy shop. Or maybe, as you’ve been cleaning your home, you’ve found some crafting supplies that are no longer being used. List them on Etsy and pass them on to someone who will bring new life to the items. Once you’ve chosen a product to sell on Etsy, set up a shop. Etsy allows each seller to have their own shop name, which correlates with a web address that allows others to type in the search bar of their browser. For example, my shop name is Gabriel’s Good Tidings, and my Etsy address is gabrielsgoodtidings.etsy.com. I highly recommended designing or purchasing a logo for your shop as this will help familiarize others with your brand, but it is not mandatory for selling on Etsy. I would also encourage a Facebook page for your Etsy shop, as many of your Facebook friends will be interested to learn about your shop. Having a Facebook page has increased my sales and traffic tremendously. Etsy’s seller handbook and help section are outstanding resources to both the new and experienced seller. 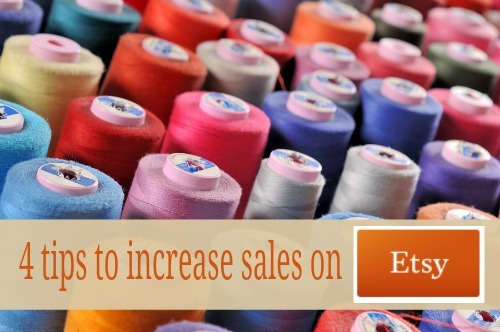 To list an item on Etsy, it will cost $0.20. When the item sells, Etsy will charge 3.5% of the selling price. Payments are accepted by PayPal or by direct checkout (selected shops only). Listing on Etsy is easy and quick — I find it much faster than Ebay. Photos are essential, and each listing is allowed up to five photos. Quality photos will boost sales quickly, and will likely get your items featured in a Treasury or on Etsy’s home page. Make sure to minimize background items, have good lighting, and portray accurate colors. In the item description, write freely as if you were in a store, describing this item to someone on the phone. Give as many details as possible. Help buyers understand why this item is useful to them. Share a story behind the item. Make sure that your shop follows the seasons. Although Etsy purchases can be made worldwide, 90% of my purchases are in the USA. Therefore, my accessories and clothing items follow the North American seasons. I list leg warmers in August when the weather starts to cool off (in some parts of the country!). I list reusable snack bags in July, when back-to-school season is in full swing. I make sure to always have enough items in October and November for the holidays. The biggest lesson I have learned about Etsy is to keep your store filled. The more items you have, the more you will sell. I try to keep my shop at 100 items, and when I do, I consistently sell 10 or so items per week. When I let my inventory drop below 50, I see a major drop in sales. When others ask me the secret to selling on Etsy, I respond with this tip: Stock equals sales. Etsy sellers are growing by the day, so the competition is steep. Make sure your items are not only high quality, accurately described, and include clear photos; but also make your prices reasonable and competitive. Research similar items and how they are selling. You don’t have to be the cheapest item in a category, but a sale will be more likely if you aren’t the priciest item. Make sure your customers know that they can purchase with confidence from your store because you will provide outstanding customer service and high quality items. When you shop at Target, you expect the cashier to put your items in a white plastic bag. In the same way, shoppers expect a handmade item to be packaged nicely. I also always include two business cards — one to keep and one to share. Adding these personal touches help customers to connect with your shop, and makes them likely to purchase from you again! I can’t say that you will make a full-time income on Etsy, but I can’t say you won’t either. There are certainly sellers who have thousands of sales per year and support their families from Etsy alone. 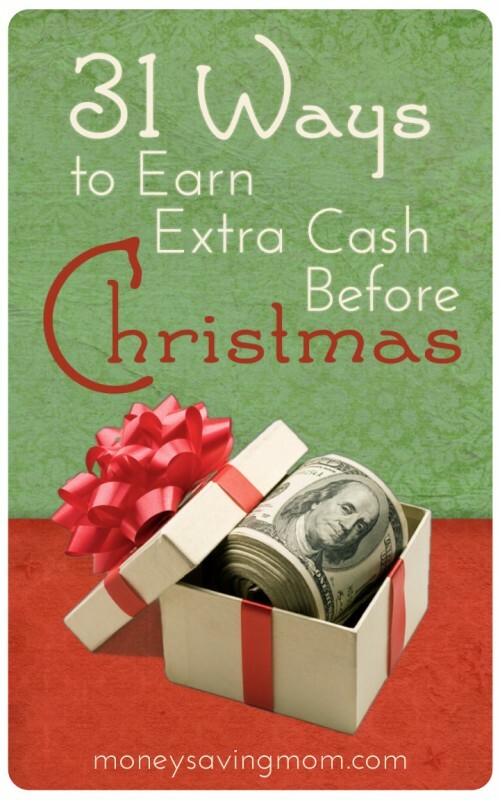 But for most of us, it’s a nice supplemental income that helps to pay for Christmas or other savings goals. I was recently able to pay cash for a kitchen update thanks in part to my Etsy sales. I have also purchased a new sewing machine from Etsy sales. While many readers of this blog get a “coupon high” when they see a receipt that shows 75% (or more!) savings, I get an “Etsy high” when my phone makes a “cha-ching” sound and I know that means another Etsy sale! Between loads of laundry and dirty dishes, Amy can be found at her sewing machine creating items for her Etsy shop. She loves her husband, her two kids, being a nurse, and of course, selling on Etsy. Find her in the blogging world at Gabriel’s Good Tidings, or at her Etsy shop. « The Ultimate List of Free Thanksgiving Printables & More! Thanks for this. I have considered setting up an Etsy shop to sell some of my handmade skin care products. Do you know if any type of business license is required for selling handmade goods? I haven’t been able to find that out yet. Thank you! That’s a great idea. I hadn’t thought of that. I appreciate you sharing. I agree with megscole64- check with someone in your state. Good luck to you and please let me know if you have any questions with getting started! I’ve been selling my jewelry on Etsy since 2005 and it has come a long way. The biggest tip is going to be the photos. You have to catch someone’s eye and you’re competing with thousands of other sellers. They can’t touch, feel, or smell your item. They can only get an idea from your photos and your description. Also, don’t UNDER price yourself. It might seem like a good way to get more sales, but it makes your items look cheap and it shows you don’t value your own time/skills. Yes, getting the right price is essential. I make jewelry, and I purposely price pretty much everything in the $10-$20 range (http://www.etsy.com/shop/NerdyNecklaces, in case y’all have Christmas shopping to do!) – that’s about how much I’d spend on a gift for a friend or family member, and it seems to be the sweet spot for other people as well. Much less than $10 and you lose too much on Etsy and Paypal fees; more than about $30 and you get fewer sales because fewer people will pay that much for gifts for friends. Also look at advertising. I highly recommend http://www.projectwonderful.com – lots of small sites use it for advertising banners, and it’s extremely easy to use. You bid as a continual auction – decide how much you’re willing to spend per day on a particular site, and if you’re the high bidder your ad goes up. If nobody else bids against you, you get your ad on the site for free! I find that $2/day more than pays for itself in increased traffic and sales. Great advice! Agreed about the photos- you can’t be too detailed! Etsy had come so far since I first joined in 2006. Remember when you had to upload pics one by one and it took forever?!?! Thank goodness we’re past those days! I just posted on my blog about their app update- you can now list from your phone! Thanks Wendy for the info about advertising- I will check that out! I will also favorite your shop. Megscole64- what is your shop name? I’d love to see it! I love sewing and have always wanted to start an Etsy shop. There is just so much out there already! There is a lot out there, but I have been amazed that with a quality product, I have been found through Etsy search and have had several people ask me for custom orders. I think the key is patience. It’s also a great idea to decide on a niche or particular style. I think many successful shops have a cohesive feel to them that results from this fine-tuning. The other commentors are right- there is a lot out there, but find what you love and others will love it too. Etsy is growing with sellers, but also with shoppers, so you have a captive audience. Good luck to you- I hope you start a shop. It is so rewarding! I just celebrated my one-year anniversary selling Cash Envelope System wallets & accessories on Etsy. Our family has been so blessed by the growth of my shop, and the income is currently sustaining us through a time of unemployment for my husband. Amy’s tips are spot-on. One thing I would add is to make sure your title, item description, and tags include descriptive keywords that will help your listings be more easily found in Search. And make use of your shop’s Stats feature to see how people are finding your items, which may lead you to experiment with some of those words and phrases to make them more effective. Agreed, Melissa! Keywords are essential and stats are super-helpful, too! PS- I’m favorite-ing your shop now- love your stuff! Don’t forget to predict misspellings, too! If you look up “locket ear rings set” you get only two hits, and one of them is mine 🙂 I also get a lot of hits off of “jewelery,” “pendent,” braclet,” etc. You’re best off using all the “tags” allowed you – and if you run out, start trying some common misspellings. It really does help! Also, don’t forget that people will only see the first part of your item title. Put the important stuff first – you may mean to say “Vintage handmade butterfly quilted table runner,” but all people will get to see when browsing is the “Vintage handmade butterfly” part. Reword it instead to say “Butterfly quilt table runner – handmade, vintage” and people will see the important part. Excellent point about keeping your important words in the front, Wendy. It’s true of your item description, too, since the first line or two are what people will see in Google search results. Etsy is great! But if you’re not at all creative, try selling vintage or unique items on there. Or sell things you already have on ebay…best time to sell is right now! I’ve been shopping yard sales for kids’ things to resell right now during Christmas…you invest very little and make a lot! Absolutely! Etsy is no longer just for the handmade items. Some of my most successful items have been vintage things. I encourage everyone to give it a try! I am favorite-ing your shop now! Thanks for the tip about trading- that is an outstanding idea! Thanks for the post Amy. Like one of Crystal’s last posts I love how this maximizes your personal passions. You have the freedom to sell whatever moves you! Amy, or anyone else who has used Etsy consistently, could you please share actual sales numbers? I know it depends greatly be person. With that said providing actual numbers helps people get a feel for what reward the pursuing Etsy can provide. It also helps them judge opportunities with Etsy vs. other money saving ideas that Crystal has proposed as part of her series. I can tell you that I’ve consistently made an average of $250 per month. While that may not be as much as other opportunities and certainly is not a full-time income, it’s all I can do to keep up with that much! I work full time outside the home right now and do this as my “outlet”. I will likely be home full-time in a year and hope to increase sales dramatically then- as my time to devote to the shop will increase, too. Thanks so much for this article, Amy. I, too, (like several other people who posted comments!) just opened an Etsy shop recently. I’ve been pretty happy with the amount of traffic I’ve gotten, but haven’t had as many sales as I would like – hopefully that will pick up eventually, especially as I’m able to create and post more items. I appreciate all of the helpful tips posted so far – license, pricing, pictures, trading, etc. If anybody has had success selling patterns instead of actual finished products, I’d love to hear your tips! I thought I posted the link to my shop in my original comment – just in case anybody wanted to check it out! 🙂 But, it appears not! I love selling my jewelry on Etsy! Thanks so much for the tips! The holiday season is a great time to make sales! I’ve been slowly building an Etsy shop for the last few months. Thanks for all this great advice! Here is a question I’ve had… I sell printable organization sheets and packets, and also handmade items like tote bags and pillowcases. I have been thinking about opening two shops to keep these things separate, but I’m afraid two shops will be too much to handle. Does it matter if I sell a variety of very different items in one shop? What would be your opinion? Wonderful article! I’ve dabbled a bit with an etsy shop, but would like to do more. How do you know how much to charge for shipping? Thanks for the advice about keeping one’s Etsy store stocked! I had about 42 items listed in my inventory before reading that – with about 12 items in my expired inventory – I relisted the expired items and had two sales the next day (0f items that had been in my inventory for months). I wonder what it is about having a deeper inventory that leads to more sales. . . . . I have a STACK of vintage sewing patterns to get listed, but like you said, seeing items sell is motivating.